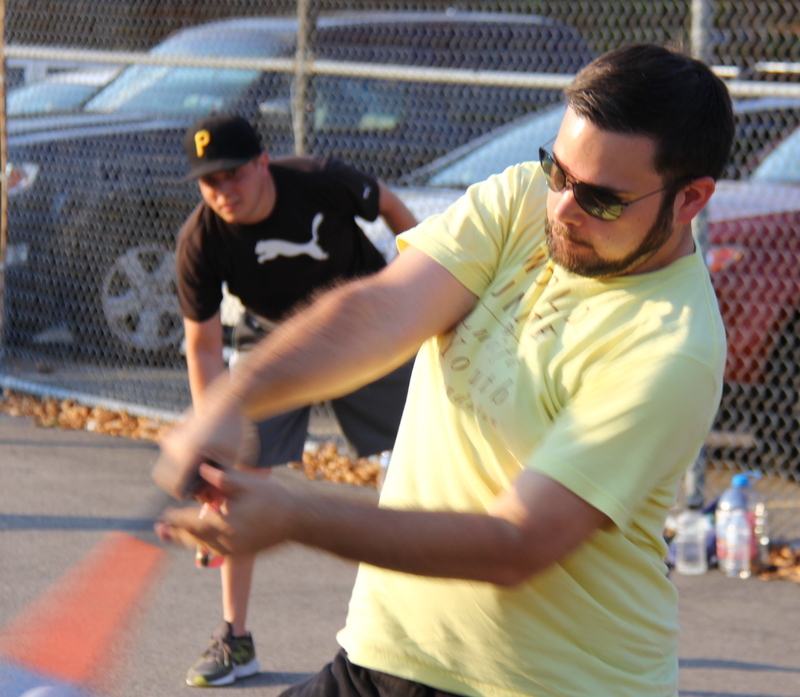 Cookies & Cream clinched a return trip to the Wiffle Series and completed their comeback against the Ham Slams by winning the final two games in their first round series, capped by an 8-5 win in game 5. 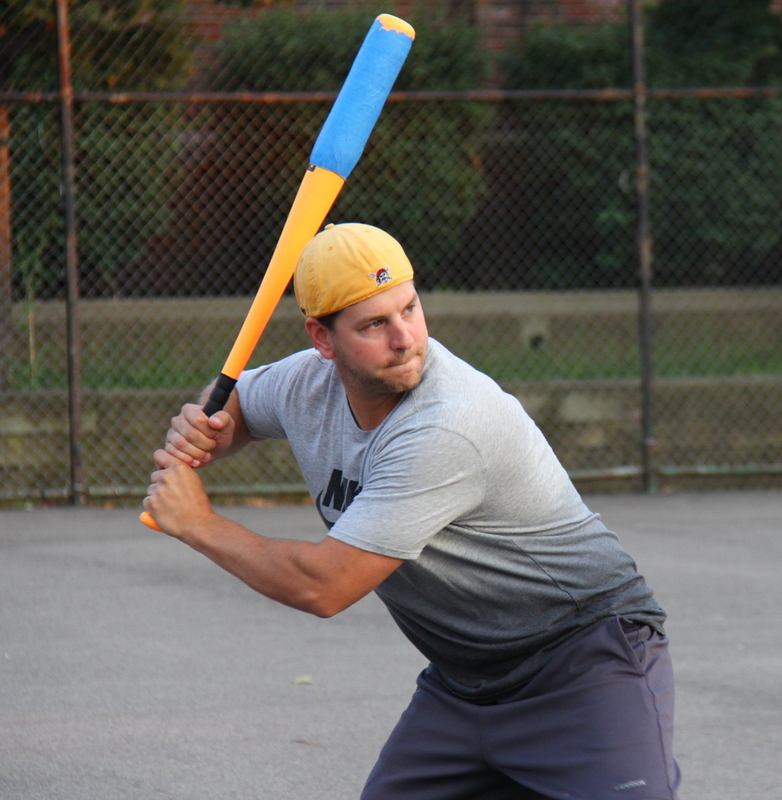 Joey homered in his first three at-bats, went 4-for-5 with 6 RBI, and pitched the complete game win to lead Cookies & Cream to victory, setting the stage for a Wiffle Series rematch against Questionable Outfit next week. After winning game 4, Joey took the mound again for Cookies & Cream in game 5. 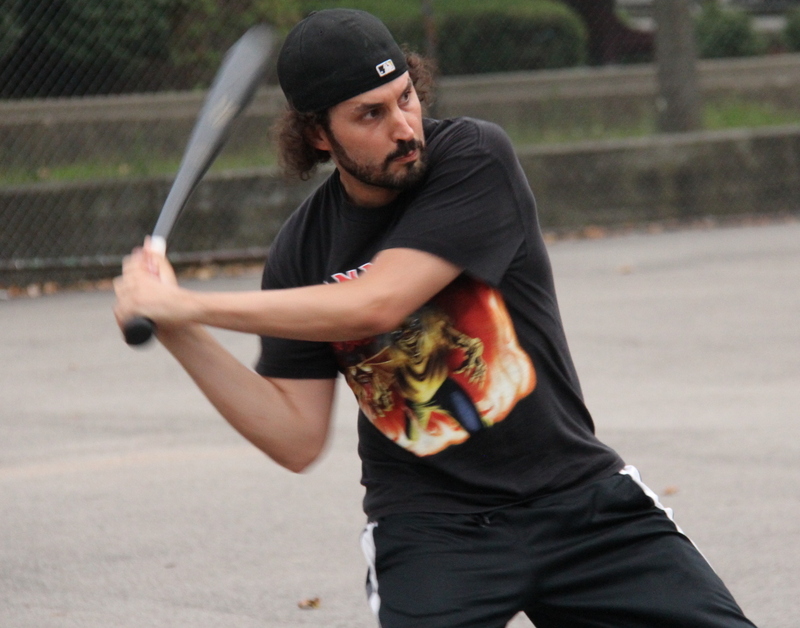 Dan went 3-for-5 against Joey in game 4, and he continued to have success in game 5. After Joey retired Josh to start the game, Dan hit a solo bomb to left field, putting the Ham Slams up 1-0. Joey then retired Joe to end the inning, and Cookies trailed by a run. Joey would provide his own run support in the bottom of the first. After Blose singled with one out, Joey hit a two-run homer to left, putting Cookies & Cream ahead 2-1. Joe, the Ham Slams starter, then retired Dinger to end the inning. Josh tripled with one out in the top of the second, but the Ham Slams couldn’t even the score, as Dan grounded out to left to end the inning, stranding the runner. Cookies & Cream would add to their lead in the bottom of the second. Guthrie started the inning with a solo homer, making the score 3-1. Blose followed with a single, and for the second consecutive inning, Joey hit a two-run blast to drive him in. Joe retired Dinger to end the inning, but Cookies had pulled out to a 5-1 lead through two innings. Joe helped himself out in the top of the third, starting the inning with a deep solo homer to left, making the score 5-2. Joey retired the next two batters, Kessler and Josh, to end the inning. Cookies continued to hit Joe hard in the bottom of the third. Joey led off the inning with a solo homer, his third consecutive bomb, and Cookies led 6-2. Dinger followed with a single, and two batters later, Blose hit a one-out triple to drive him in, making the score 7-2. Joey then singled, scoring Blose, pushing the score to 8-2. Joey, hobbled by an ankle injury, was caught in between first and second for the second out of the inning. Joe singled with one out in the top of the third, and he moved to second when Kessler followed with a single. The Ham Slams had two runners on, but Josh flew out to left for the second out of the inning, stranding both runners. Joe pitched his first perfect frame in the bottom of the fourth, retiring Dinger and Guthrie in order, and the score remained 8-2. 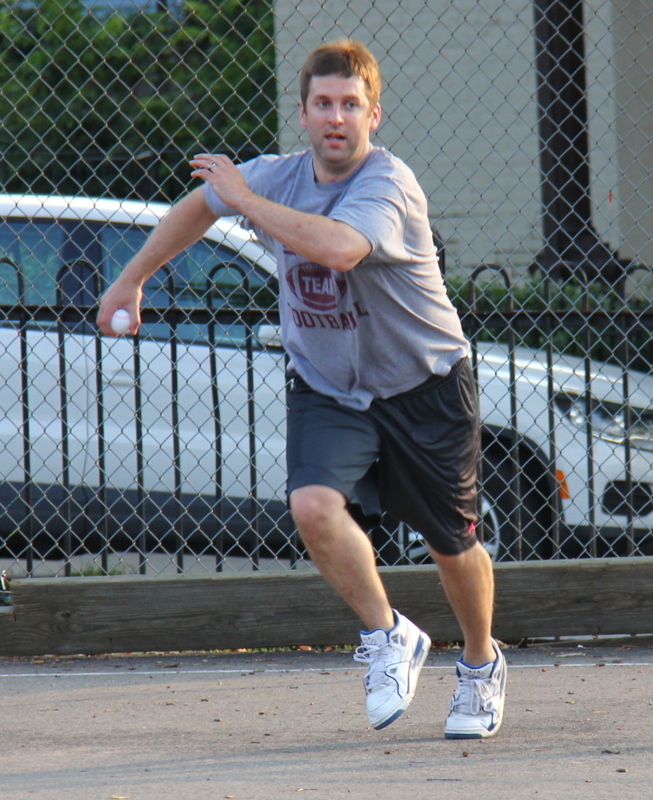 The Ham Slams were running out of time, and they started a comeback in the top of the fifth. Joe tripled with one out, and he scored when Kessler followed with an RBI double, making the score 8-3. Josh then hit a ball off the fence, and after a series of fielding errors, raced around the bases for a two-run inside-the-park homer. Cookies were showing signs similar to their collapse in the final game of the season against Questionable Outfit, and the Ham Slams were gaining momentum. Dan hit a double, and the Ham Slams trailed 8-5 with one out and a runner on second. Joey buckled down, retiring Joe for the second out of the inning, stranding the runner at second. Cookies & Cream couldn’t add any insurance runs in the bottom of the fifth, as Joe retired the side in order, including sending Joey down for the first time in the game. 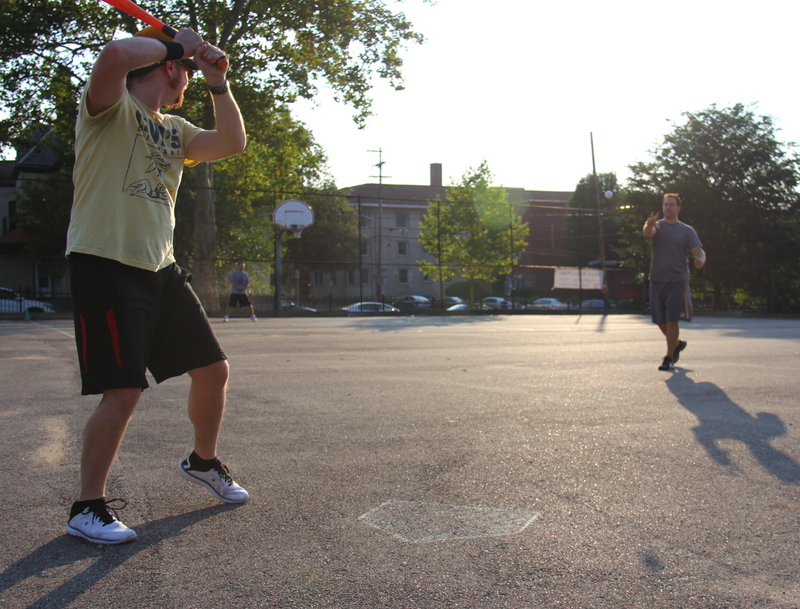 The Ham Slams were down to their final at-bat of the season, trailing 8-5 in the top of the sixth. Joey got the first batter, Kessler, to fly out to center, and Cookies & Cream were one out away from advancing to the Wiffle Series. The next batter, Josh, hit a towering fly ball to left. Blose camped under it, caught the ball for the second out of the inning, and Cookies & Cream had won game 5 by the score of 8-5. The victory clinched a Wiffle Series berth for Cookies & Cream, where they will face Questionable Outfit for the fourth consecutive season. The loss ended the Ham Slams season, and they will look to contend for a title in 2017. – Joey pitched the complete game win for Cookies & Cream, allowing 5 runs on 9 hits in 6 innings. 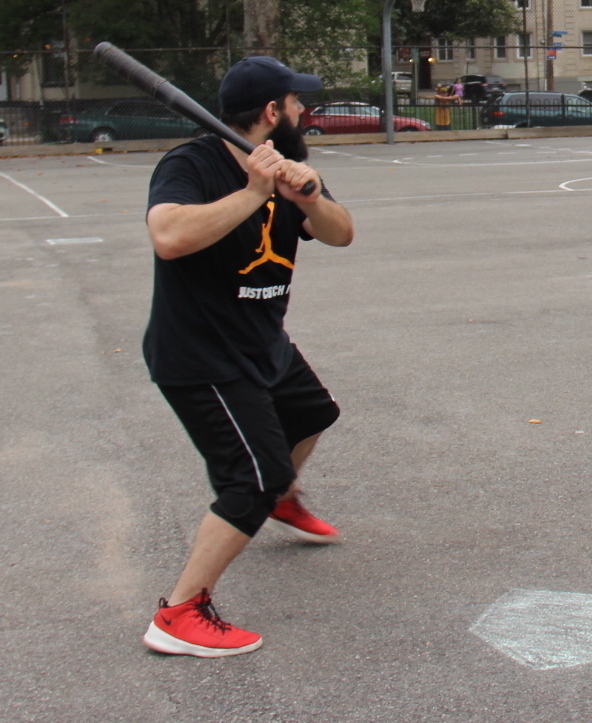 – Joe took the loss for the Ham Slams, giving up 8 runs on 10 hits in 5 innings. – Joey led Cookies & Cream on offense, going 4-for-5 with a single, three home runs, three runs scored, and six RBI. – Joe led the Ham Slams at the plate, going 3-for-5 with a single, a triple, a homer, 2 runs scored, and one RBI. – Cookies & Cream are now 4-0 in game 5s in franchise history. After falling behind 2-1 in the best-of-five series with the Ham Slams, Cookies & Cream bounced back in game 4, winning 7-4 and forcing a game 5 where the winner will advance to the Wiffle Series to face Questionable Outfit. Blose and Guthrie each went 4-for-6 to lead Cookies, with Blose contributing a single, two doubles, and a homer and Guthrie collecting a single, two doubles, and a triple. The Ham Slams ace, Josh, took the mound for the Ham Slams, and he fell behind early. Guthrie led off the game with a triple, and Blose drove him in with an RBI double that put Cookies & Cream ahead 1-0. Two batters later, Dinger singled, putting runners on the corners with one out. Guthrie then singled, scoring Blose to make the score 2-0. Cookies had two men on and were threatening to take a big lead, but Josh retired Blose to end the inning, stranding both runners. Cookies & Cream started Joey in his first pitching appearance of the 2016 postseason. After retiring Josh to start the bottom of the first, Dan tripled. Joe continued to swing a hot bat, hitting an RBI double to make the score 2-1. Joey then retired Adam to strand Joe and end the inning, and Cookies & Cream led by a run after one. Josh fanned Joey for the first out in the top of the second, and he got Dinger to fly out to center for the second out. Joey allowed a one-out double to Dan in the bottom of the second, but stranded him, retiring Joe to end the inning. Cookies & Cream would jump out to a big lead in the top of the third. Guthrie doubled to start the inning, and when Blose followed with a single, Guthrie was caught trying to get from first to third for the first out of the inning. With one out and a runner on first, Joey tripled, scoring Blose, and Cookies led 3-1. Dinger then singled, scoring Joey to put Cookies ahead 4-1. Guthrie followed with a double to put runners on second and third, and Blose cleared the bases with a two-RBI double, extending the Cookies lead to 6-1. Josh finally escaped the inning by retiring Joey, stranding Blose at second. Down 6-1, the Ham Slams were retired in order in the bottom of the third, as Adam and Josh flew out to Jordan in center field. Josh matched Joey in the top of the fourth, sending Dinger and Guthrie down consecutively. The Ham Slams cut into the Cookies & Cream lead in the bottom of the fourth. Joe triple with one out, and Kessler drove him in with a two-run blast to left, making the score 6-3. Joey then retired Josh to end the inning, and Cookies & Cream led by three runs. Kessler squares up a pitch. His two-run homer in the fourth inning narrow the Cookies & Cream lead. Blose led off the top of the fifth with a solo shot to left, putting Cookies & Cream ahead 7-3. Joey followed with a double, but Cookies couldn’t add more insurance runs, as Josh retired Dinger and Guthrie to strand the runner and end the inning. Dan tripled to start the bottom of the fifth, and he scored on a Joe groundout to right field. Joey then retired Kessler for the second out of the inning, and Cookies led 7-4 heading into the sixth. Josh retired the side in order in the sixth, as Blose and Joey both popped out. Up four runs, Joey remained in the game to close things out in the bottom of the sixth. He got Josh to fly out to Blose in left for the first out of the inning, and Dan flew out to deep center field for the second out, ending the inning and the game. The 7-4 Cookies & Cream win tied the series, forcing a decisive game 5 in the first round series. – Joey pitched the complete game win for Cookies & Cream, giving up 4 runs on 6 hits in 6 innings. – Josh took the loss for the Ham Slams, allowing 7 runs on 12 hits and striking out one in 6 innings. – Blose and Guthrie each went 4-for-6 to lead Cookies & Cream. Blose had a single, 2 doubles, a home run, 3 runs scored, and 4 RBI. Guthrie had a single, 2 doubles, a triple, 2 runs scored, and one RBI. 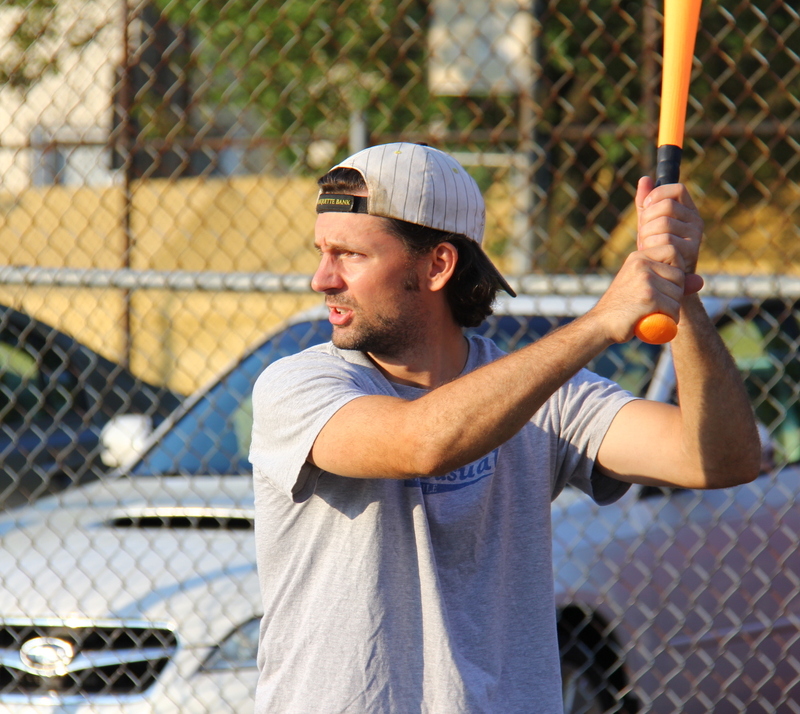 – Dan led the Ham Slams on offense, going 3-for-5 with a double, two triples, and two runs scored. – Cookies & Cream have played in a game 5 the past four consecutive years in the first round of the playoffs. 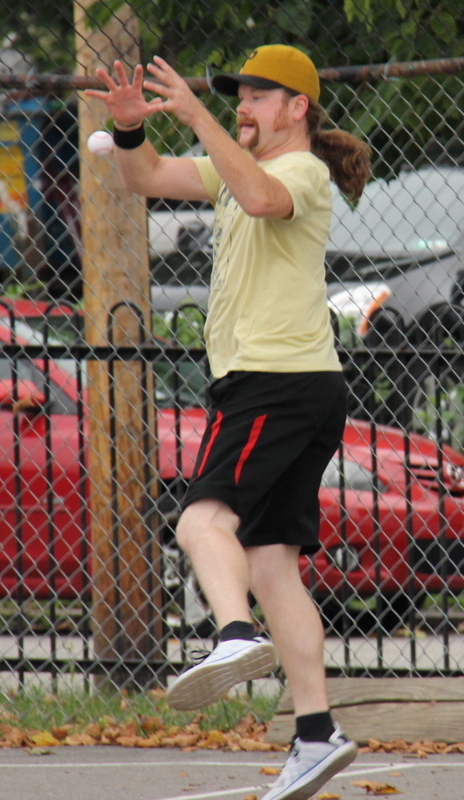 – Dan tied the single-game playoff record for triples, with two. 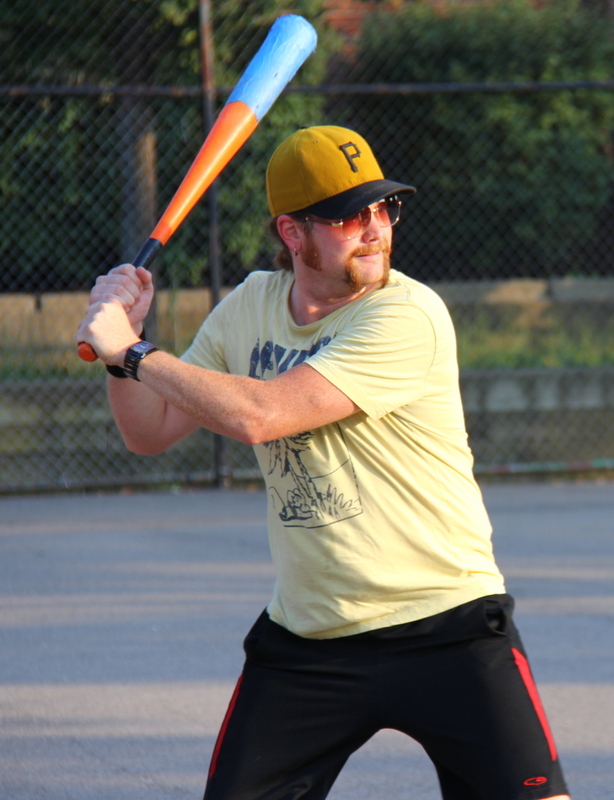 Bob went 6-for-7 at the plate and pitched a complete game win as Questionable Outfit finished a sweep in their best-of-five first round series with Eastbound & Dahn. 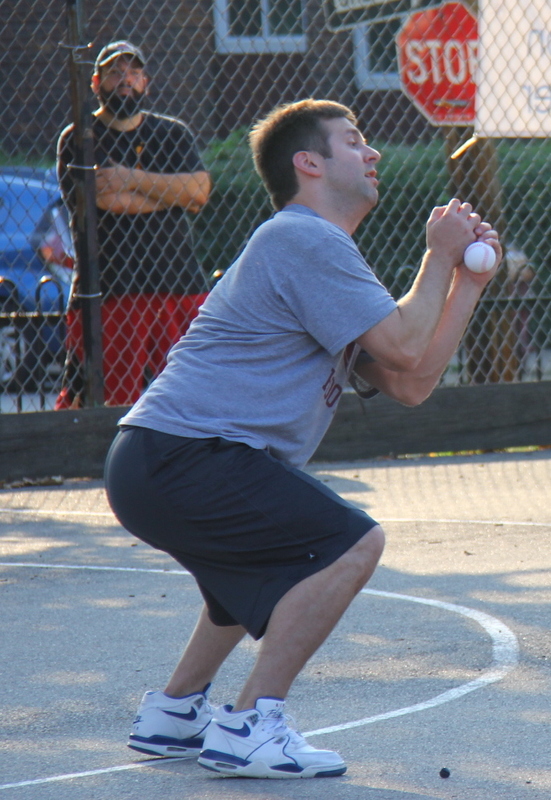 The two-time defending champions Questionable Outfit will advance to the Wiffle Series for the fourth consecutive year, and they will await the conclusion of the Ham Slams vs. Cookies & Cream series which will determine their opponent. BK took the mound for Eastbound & Dahn to start game 3, as Eastbound looked to extend the series and their 2016 season. He allowed a single to the leadoff hitter, Bob, and two batters later, Mike hit an RBI single that scored Bob from first, putting Questionable Outfit ahead 1-0. BK then retired Miller to end the inning. In an odd managerial decision, Bob started for Questionable Outfit in place of their ace, Miller. After retiring the first batter he faced, Tim, Nate hit a double. Helal followed with an RBI single, scoring Nate to tie the game at 1-1. Helal was caught in between first and second on the play for the second out, ending the inning. BK allowed a one-out single to Tom in the top of the second, but Questionable couldn’t take another lead, as Mike was retired to end the inning. Bob retired Eastbound in order in the bottom of the second, and the game remained tied. Miller singled to start the top of the third, but he was caught trying to extend the hit to a double, and BK had the first out of the inning. Bob followed with a solo homer, putting Questionable ahead 2-1. BK then retired Tom to end the inning. Eastbound bounced back in the bottom of the third, taking the lead. Tim doubled with one out, and Nate followed with an RBI triple that tied the game at 2-2. Helal then hit a triple, scoring Nate, and Eastbound led 3-2. Bob struck out Christian for the second out of the inning, stranding the runner at third. Eastbound was halfway to forcing a game 4 when Questionable had a big offensive inning, which has become their trademark. Mike led off the top of the fourth with a homer, and Miller followed with a titanic blast. The back-to-back jacks put Questionable Outfit back in front 4-3. Bob then hit a line drive off the fence, and a series of fielding errors led to an inside-the-park homer, and Questionable led 5-3. 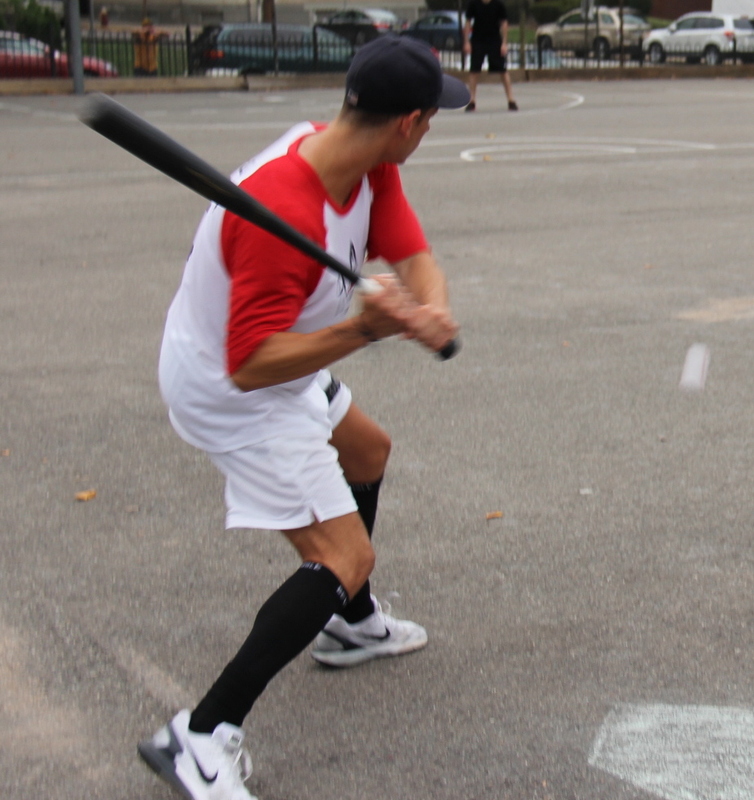 Tom hit a deep blast to left, and Questionable Outfit had homered in four consecutive at-bats to take a 6-3 lead. BK finally retired Mike for the first out of the inning, but Miller followed with a triple. Bob singled on an error, and although Miller couldn’t score, Questionable had runners on first and third. BK escaped further damage, however, getting Tom to ground out to left to end the inning, stranding both runners. Bob cruised through the bottom of the fourth, retiring the side in order. Eastbound removed BK from the mound and turned to the bullpen, inserting Christian into the game in the top of the fifth. After retiring Mike, he gave up a single to Miller and a double to Bob, putting two runners in scoring position with one out. Questionable couldn’t add to their lead though, as Tom grounded out to Tim in center, stranding both runners and ending the inning. Bob continued to roll in the bottom of the fifth, sending Tim and Nate down consecutively. Questionable would add one more run of support in the top of the sixth. Mike doubled to start the inning, and two batters later Bob hit an RBI single to make the score 7-3. Christian then retired Tom to end the inning, and Eastbound trailed by four runs heading into the bottom of the sixth. With their season on the line, Eastbound couldn’t string together enough hits, or any hits, as Bob retired Helal and Christian in order to end the inning. The 7-3 victory put Questionable Outfit back into the Wiffle Series where they will attempt to defend their title and three-peat. Eastbound & Dahn finished a difficult season and will look to return to their 2015 form in 2017. – Bob pitched the complete game win for Questionable Outfit, giving up 3 runs on 5 hits and striking out one in 6 innings. – BK took the loss for Eastbound, allowing 6 runs on 11 hits in 4 innings. – Christian pitched two innings of relief for Eastbound & Dahn, allowing 1 run on 4 hits. – Bob led Questionable Outfit on offense, going 6-for-7 with 3 singles, a double, a home run, 3 runs scored, and 2 RBI. – Nate led Eastbound & Dahn at the plate, going 2-for-3 with a double, a triple, 2 runs scored, and an RBI. Joe is only three games into his EWL career, but he has already made his presence felt in a big way. After leading his team to a game 2 victory last week, he picked up where he left off, pitching another complete game win in game 3 and putting the Ham Slams ahead for good with a three-run blast in the bottom of the third. 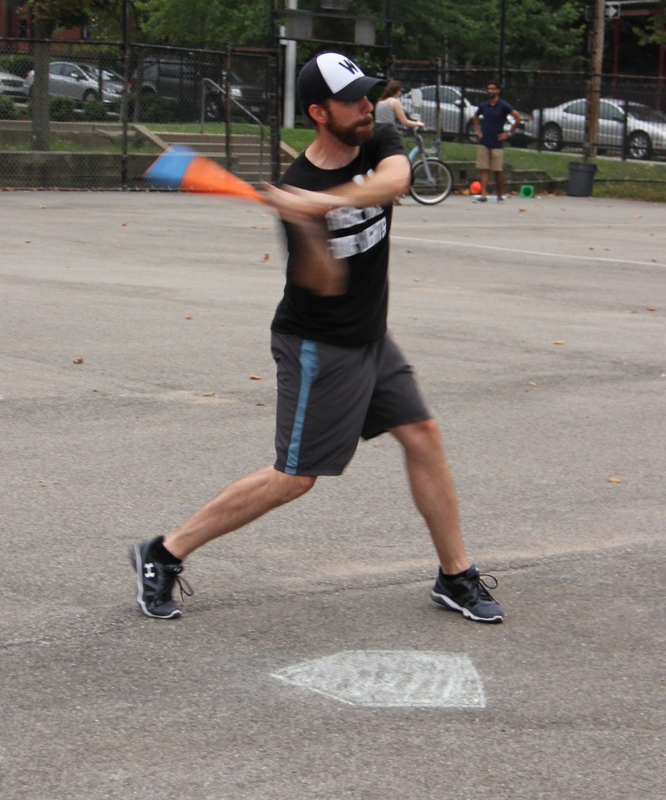 The win put the Slams ahead 2-1 in the best-of-five series with Cookies & Cream and one win away from the franchise’s first Wiffle Series berth. Although Joe kept Cookies & Cream in check throughout the game, he got behind early. After retiring Guthrie to start the game, Blose launched a solo homer to center, and Cookies & Cream led 1-0 quickly. 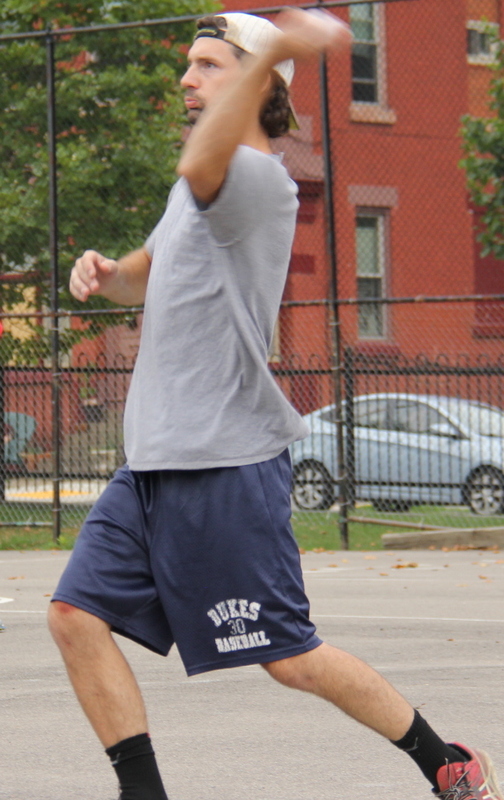 Joe then retired Joey, playing somewhat hobbled one week after sustaining an ankle injury in game 2 against the Slams. Guthrie took the mound for Cookies & Cream, and he avoided trouble in the bottom of the first. Josh led off with a double and moved to third on a Dan groundout. Joe then singled, putting runners on the corners with one out. Guthrie maintained the one-run lead, however, getting Kessler to fly out to the mound for the second out, stranding both runners. Joe cruised through the top of the second, retiring the side in order, and his team would pull ahead in the bottom half of the inning. Josh led off with a solo homer to right-center, tying the game at 1-1. Two batters later, Joe doubled, and Kessler followed with an RBI single that gave the Ham Slams a 2-1 lead. Josh then doubled, and the Ham Slams had two runners in scoring position. Guthrie once again escaped a jam, getting Dan go fly out to right, stranding two more runners and ending the inning. Joe continued to roll in the top of the third, sending Guthrie and Blose down consecutively. The Slams would open up a big lead in the bottom of the third. Joe led off with a double, and he scored when Kessler followed with his second RBI single of the game. Kessler was caught trying to extend the single into a double, and Guthrie had the first out of the inning. Josh and Dan then each hit singles, and the Slams had runners on the corners with one out. Joe came to the plate and crushed a three-run homer to deep left field, putting the Ham Slams ahead 6-1. Guthrie retired Kessler to end the inning, and the Ham Slams had pulled ahead by five runs. Dinger would double with one out in the top of the fourth, but Cookies & Cream couldn’t capitalize, as Jordan was retired for the second out of the inning, stranding the runner at second. Guthrie retired the side in order in the bottom of the fourth, and Cookies would cut into the Ham Slams lead in the top of the fifth. Guthrie tripled to start the inning, and he scored when Blose grounded out for the first out of the inning. Joe then retired Joey to end the inning with the score 6-2. The Slams couldn’t add any insurance runs in the bottom of the fifth, and they would head into the final frame with a four run lead. Jordan tripled with one out in the top of the sixth, but Cookies couldn’t put together a rally. Joe retired Guthrie to strand the runner, ending the inning and the game. The 6-2 game 3 win put the Hams Slams ahead 2-1 in the best-of-five series with Cookies & Cream. 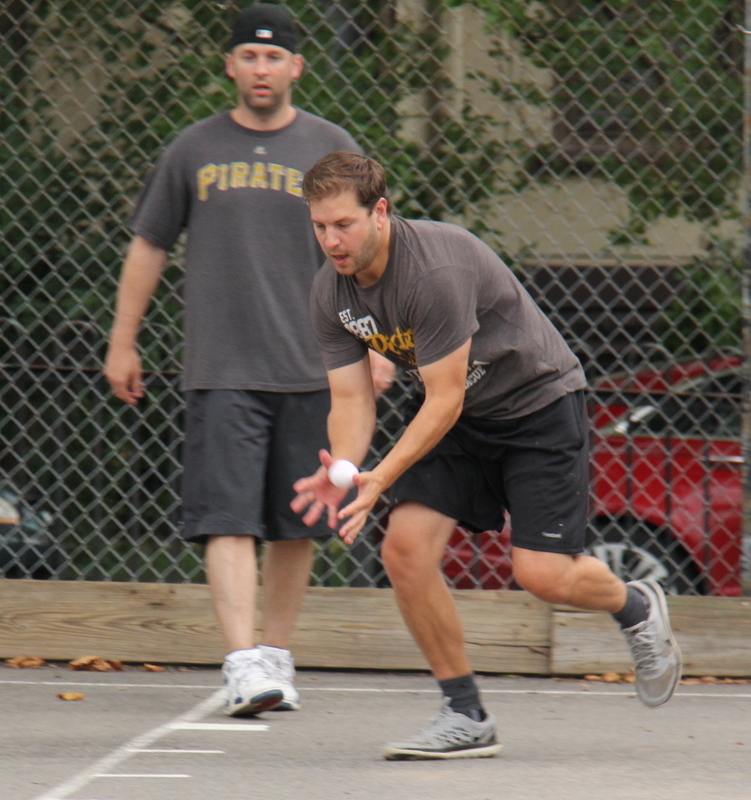 A win in game 4 would earn a berth in the 2016 EWL Wiffle Series. 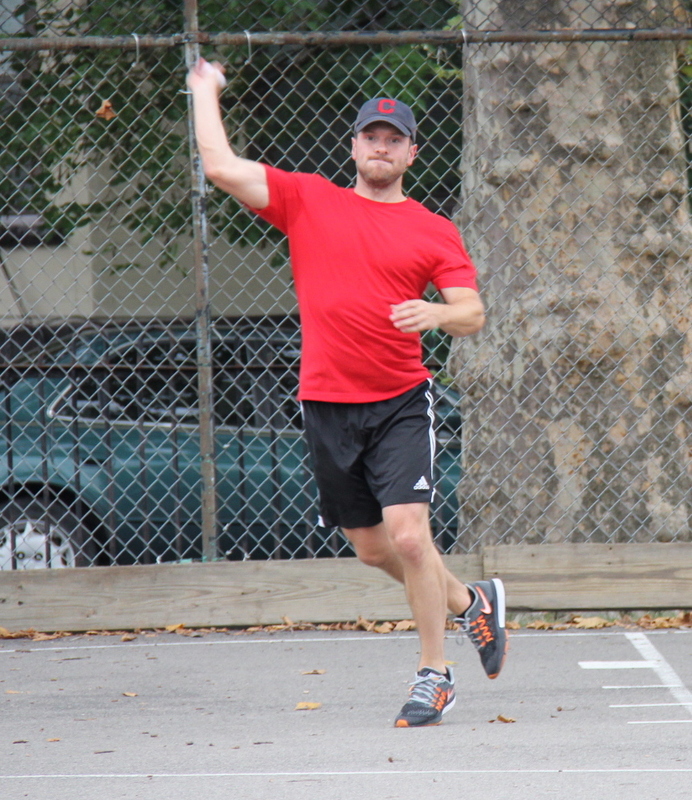 – Joe pitched the complete game win for the Ham Slams, giving up 2 runs on only 4 hits in 6 innings pitched. – Guthrie earned the loss in the complete game effort for Cookies & Cream, giving up 6 runs on 11 hits in 5 innings. – Joe led the Ham Slams on offense, going 4-for-5 with a single, 2 doubles, a home run, 3 runs scored, and 3 RBI. – Josh also went 4-for-5 with the Ham Slams with a single, 2 doubles, a home run, 2 runs scored, and one RBI. – Guthrie, Blose, Dinger, and Jordan each had one hit for Cookies & Cream in the loss. 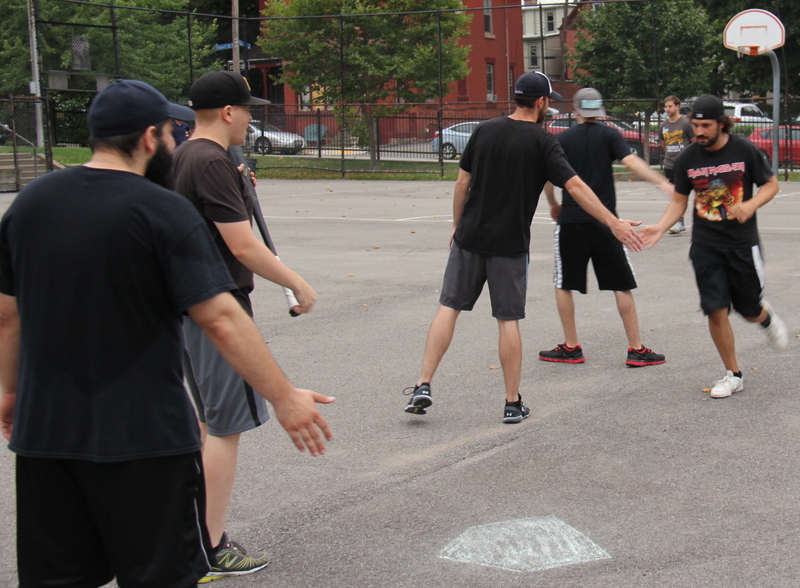 Questionable Outfit put Eastbound & Dahn on the brink of elimination and took a 2-0 lead in their best-of-five first round series with a 13-9 win in game 2. Bob and Mike each hit for the cycle, becoming the first teammates to hit for the cycle in the same game in EWL playoff history. 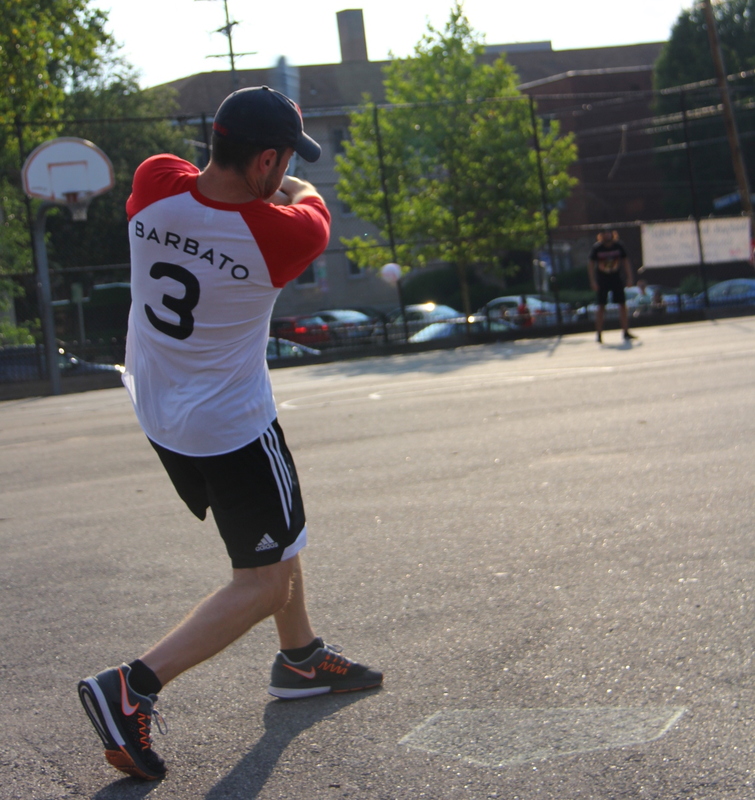 Bob had six hits and scored five runs, and Mike had five hits, as Questionable held off a late Eastbound & Dahn rally to win and put themselves one win away from a fourth consecutive Wiffle Series berth. Bob started on the mound for Questionable Outfit, and he cruised in the top of the first, retiring Nate and Christian in order. Questionable Outfit would immediately provide Bob with run support, taking a significant lead in the bottom of the first. Bob singled to lead off the inning, and he moved from first to third on a Tom single. Mike then doubled, scoring Bob, and the score was 1-0. Miller came to the plate with runners on second and third, and he cleared the bases with a three-run bomb, putting Questionable Outfit ahead 4-0. Bob followed with a double, and after five consecutive hits to start the game, it looked like Questionable Outfit would have a huge inning. Christian buckled down, however, and avoided further damage, retiring Tom and Mike to strand the runner at second and end the inning. Eastbound & Dahn showed resolve in the top of the second, bouncing back and cutting into the Questionable Outfit lead. Dustin singled, and he moved to second when BK followed with a single. Two batters later, Christian cleared the bases and rounded them all himself when Questionable Outfit unleashed a series of fielding errors that resulted in a three-run inside-the-park homer. Bob then retired Dustin to end the inning, but Eastbound had cut the lead to 4-3. Christian pitched a perfect frame in the bottom of the second, sending Miller and Bob down in order. Bob matched him in the top of the third, as BK and Nate were retired consecutively. Questionable would add to their lead in the bottom of the third. Tom led off the inning with a solo shot, and Mike made it back-to-back homers with a solo homer of his own. Two batters later Bob tripled, and Tom drove him in with an RBI single that made the score 7-3. Mike followed with a single, and Questionable had runners on first and third, but Christian retired Miller to strand both runners and end the inning. Eastbound continued to hang in, narrowing the deficit in the top of the fourth. Christian doubled to start the inning, and he scored when Dustin followed with an RBI triple. BK then singled, scoring Dustin, and Eastbound trailed 7-5. Nate followed with a single, but BK was caught in between first and second for the first out of the inning. Bob then retired Christian to end the inning, and Questionable led by two. Bob led off the bottom of the fourth with a solo homer, completing the cycle in only five at-bats. Tom followed with a single, but Christian retired Mike and Miller to strand him, and Questionable Outfit led 8-5 after four innings. Bob retired the side in order in the top of the fifth, and Questionable would extend their lead by a considerable margin in the bottom of the inning. Bob tripled for the second time in the game to lead off the inning, and he scored when Tom drove him in with an RBI single that made the score 9-5. 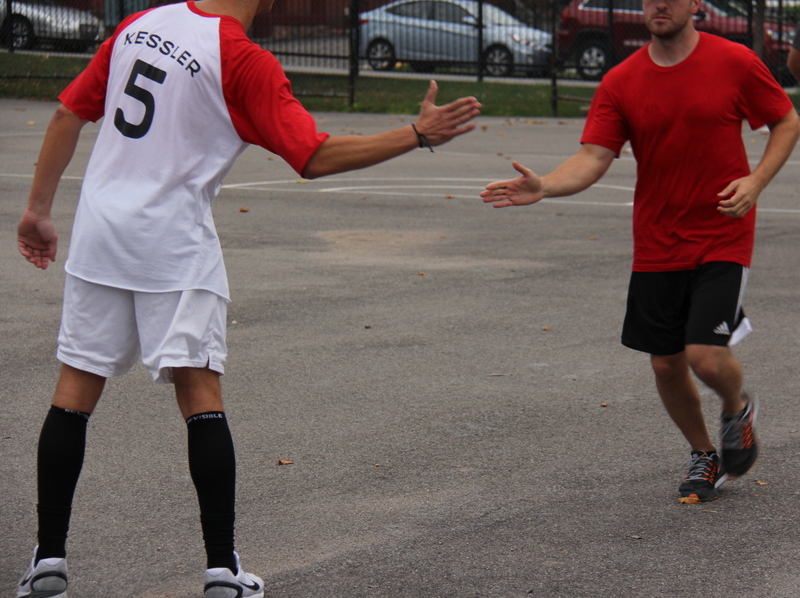 Mike then tripled, completing the cycle, and Tom scored on the play to put Questionable ahead 10-5. Two batters later, Bob doubled to score Mike, and the score was 11-5. Tom then doubled to score Bob, and Mike followed with an RBI single to score Tom. Christian finally retired Miller to end the inning, but Questionable had scored five runs to pull ahead 13-5. Down eight heading into their final at-bat, Eastbound & Dahn made things interesting in the top of the sixth. Nate led off the inning with a triple, and Christian hit a deep sacrifice fly to center, scoring Nate to make the score 13-6. Dustin then singled, and he scored from first when BK hit an RBI single, and the score was 13-7. Nate then hit a towering two-run homer to left-center, and Eastbound had cut the Questionable lead to 13-9. Questionable Outfit removed Bob from the mound and brought in Tom from the bullpen. He immediately put an end to the Eastbound rally, striking out Christian for the second out of the inning, ending the game and giving Questionable Outfit the 13-9 win. Questionable Outfit pulled ahead 2-0 in the best-of-five first round series with Eastbound & Dahn. 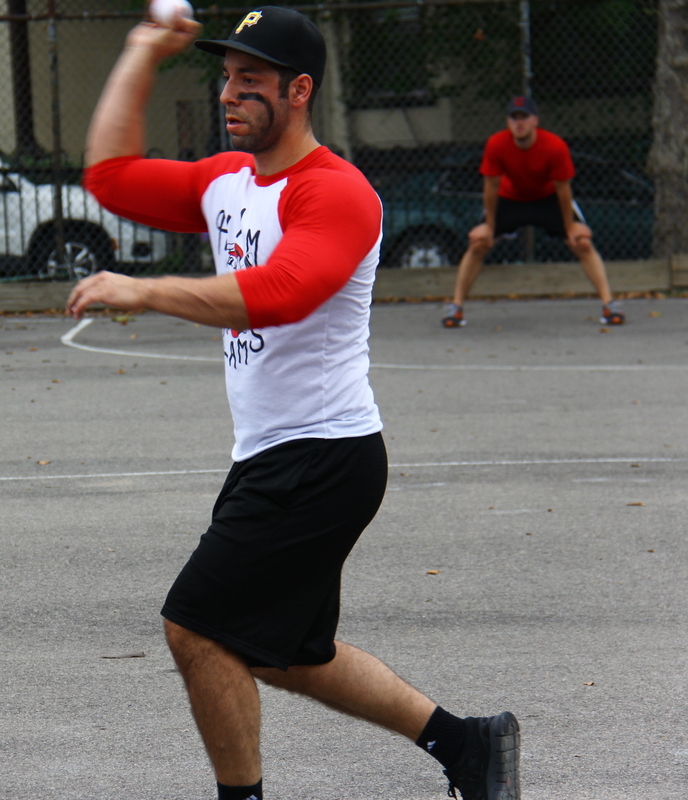 A win in game 3 would put them in the Wiffle Series for the fourth consecutive season. No team has come back from an 0-2 deficit to win a first round series. 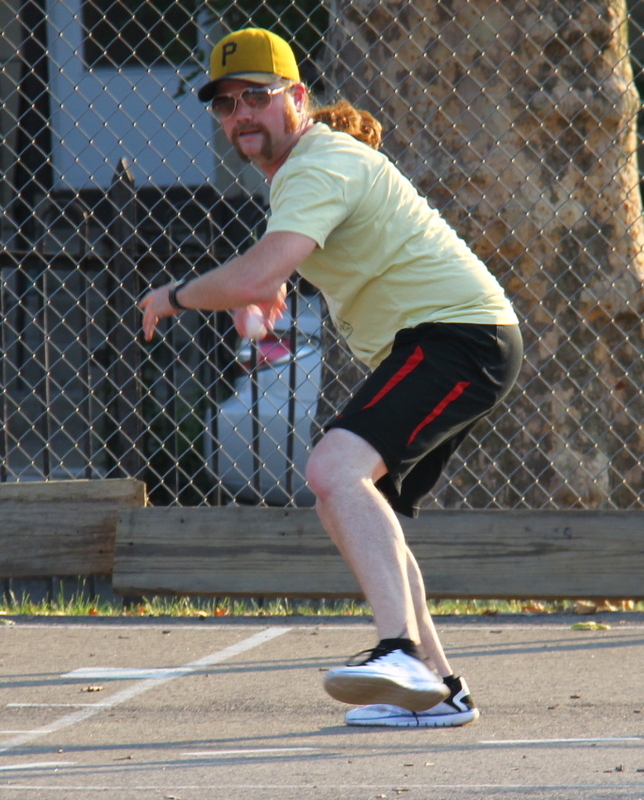 – Bob earned the win for Questionable Outfit, allowing 9 runs on 10 hits in 5.5 innings pitched. – Tom pitched 0.5 innings of relief, and struck out the only batter he faced. – Christian took the loss for Eastbound in the complete game effort, giving up 13 runs on 18 hits in 5 innings. – Bob went 6-for-7 and hit for the cycle with a single, 2 doubles, 2 triples, a home run, 5 runs scored, and 3 RBI. – Mike also hit for the cycle, going 5-for-6 with 2 singles, a double, a triple, a homer, a sacrifice fly, 3 runs scored, and 4 RBI. – All four Eastbound & Dahn players had at least two hits. They were led by Dustin, who went 3-for-5 with 2 singles, a triple, 3 runs scored, and an RBI. Playing in only his second career EWL game, Joe pitched a complete game win and went 3-for-5 at the plate with a triple, two home runs, 3 runs scored, and two RBI. After dropping game one, the Ham Slams, led by free agent addition Joe, won game two 7-5 and evened the best-of-five first round series with Cookies & Cream at one game apiece. Joe pitched the complete game win and went 3-for-5 with a triple, two homers, three runs scored, and two RBI. Cookies & Cream suffered a blow as Joey left the game early with one of the most significant wiffle injuries in league history, and they may be without him for the rest of the series. Dinger took the mound for Cookies & Cream, and he fell behind early when Josh led off the game with a solo homer to right-center, putting the Ham Slams up 1-0. Dinger then got Dan and Joe to fly out to center to end the inning. Cookies & Cream evened the score immediately when Guthrie led off the bottom of the first with a solo homer, making the score 1-1. Blose followed with a triple, and Cookies were in position to pull ahead, but Joe got Joey to fly out in foul territory and got Dinger to fly out to center, ending the inning and stranding the runner. The Slams took another lead in the top of the second. 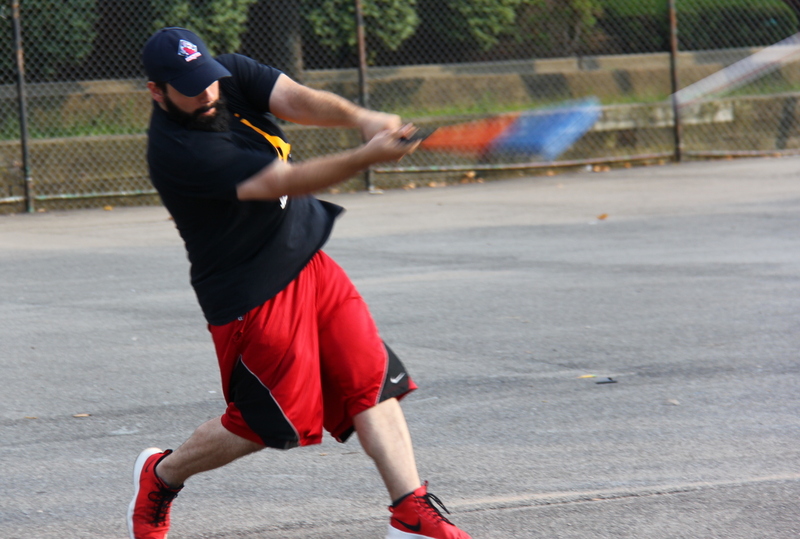 Kessler doubled to start the inning, and two batters later Dan hit a two-run blast to center, and the Slams led 3-1. Joe followed with a triple, and he scored when Kessler hit an RBI double. Dinger retired Josh to strand Kessler at second and end the inning, but the Slams had pulled ahead 4-1. Dan’s two-run homer in the second put the Ham Slams ahead 3-1. Guthrie doubled with one out in the bottom of the second, and he scored when Blose hit an RBI single. Joe then retired Joey to end the inning, and Cookies had cut the deficit to 4-2. Dan led off the top of the third with a towering fly ball to center. Joey backed up against the fence and jumped to catch the ball and record the out. He came down awkwardly, however, twisting his ankle severely. He was carried off the field by his teammates and went to the hospital to seek medical attention. When play resumed, Joe provided his own run support with a solo homer, putting the Ham Slams ahead 5-2. Kessler followed with a solo shot, and the back-to-back homers made the score 6-2. Josh followed with a double, and Cookies & Cream made a pitching change, bringing Guthrie into the game. He retired the first batter he faced, Dan, for the second out, ending the inning and stranding the runner at second. Kessler went 3-for-5 with 2 doubles, a home run, 2 runs scored, and 2 RBI. Joe rolled through the bottom of the third, retiring Dinger and Jordan in order, and the score remained 6-2. Joe continued to help himself at the plate, leading off the top of the fourth with a solo homer. Guthrie retired the next two batters to end the inning, and the Ham Slams led 7-2. Cookies would narrow the margin in the bottom of the fourth. Guthrie led off with a double, and Blose followed with a two-run homer, cutting the score to 7-4. Dinger followed with a double, and just when it looked like Cookies would rally, Joe retired Jordan and Guthrie to strand the runner and end the inning. Blose went 4-for-5 with a single, 2 triples, and a homer. Here he connects on a two-run blast in the fourth that cut the Ham Slams lead to 7-4. Guthrie retired the side in order in the top of the fifth, and he had met his innings limit for the week. Blose tripled to start the bottom of the fifth, and he scored on a Dinger groundout to cut the deficit to 7-5. Joe then retired Jordan to end the inning, and Cookies trailed by two runs. Dinger returned to the mound in the top of the sixth, and he had more success than earlier in the game, retiring Kessler and Josh consecutively. Down two runs in the bottom of the sixth with their two best hitters due up, Cookies couldn’t string together a rally to extend the game. Joe retired Guthrie and Blose, ending the inning and giving the Ham Slams a 7-5 win. With the win, the Ham Slams evened the best-of-five series with Cookies & Cream at 1-1. 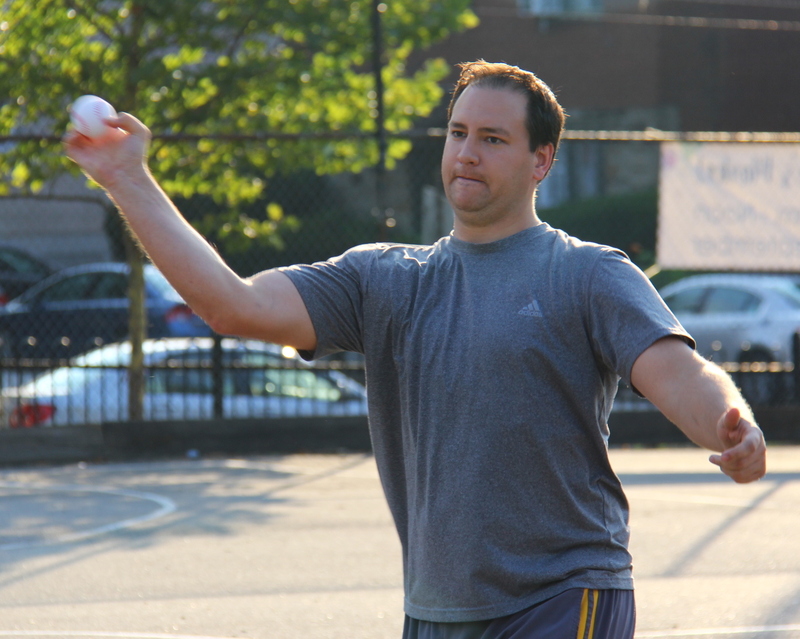 – Joe pitched the complete game win for the Ham Slams, allowing 5 runs on 8 hits in 6 innings. – Dinger took the loss for Cookies & Cream, giving up 6 runs on 8 hits in 4 innings. – Guthrie pitched two innings of relief for Cookies, and gave up one run on one hit. – Joe led the Ham Slams on offense, going 3-for-5 with a triple, a homer, 3 runs scored, and 2 RBI. 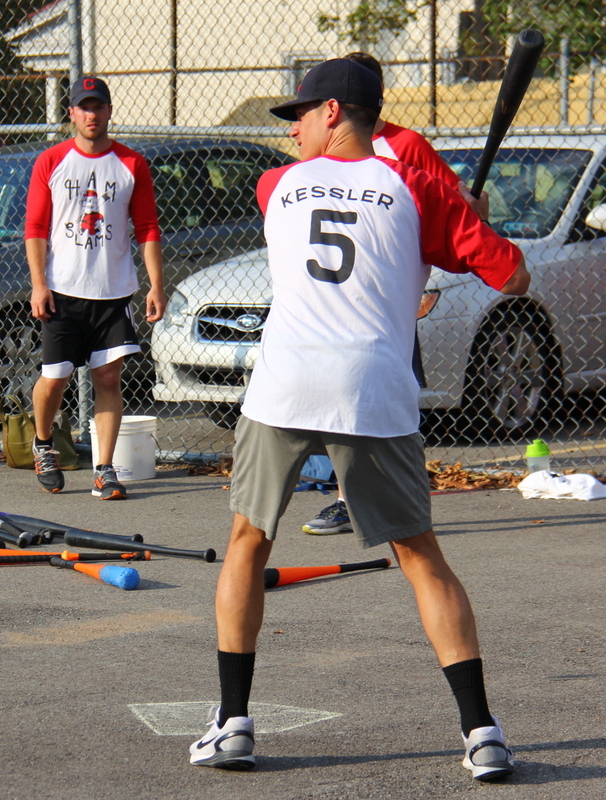 – Kessler also went 3-for-5 for the Slams with 2 doubles, a homer, 2 runs scored, and 2 RBI. – Blose led Cookies & Cream at the plate, going 4-for-5 with a single, 2 triples, a homer, 2 runs scored, and 3 RBI. – Guthrie also went 3-for-5 for Cookies with 2 doubles, a home run, 3 runs scored, and an RBI.